Johnathan, a fifteen-year-old African American from Long Beach, California, shares his story of being physically and verbally harassed because of his race, and of overcoming the discrimination to embrace all cultures, and then to be proud of his own. 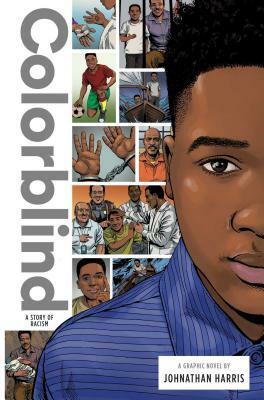 Colorblind: A Story of Racism is the third in a series of graphic novels written by young adults for their peers. Johnathan Harris is fifteen, and lives in Long Beach, California, where he loves playing soccer with his friends, and listening to their favorite rapper, Snoop Dogg, a Long Beach native. His mom, dad, and three brothers are tight, but one of the most influential family members for Johnathan is his Uncle Russell, a convict in prison, serving fifteen years to life . . .
Uncle Russell taught Johnathan from a very young age to see people from the perspective of their cultures, and not just their skin color. He imbued a pride of his ancestry and cautioned against letting hatred into his heart. But when Johnathan was just eight years old, something happened that filled him with fear and the very hatred that Uncle Russell had warned him about. What happened to Johnathan made him see that a dream of a colorless world was just that. A dream. That event shook him to his core. Anger grew inside him like a hot coal. Uncle Russell had told him to “throw it away or you will get burned,” but Johnathan was young and frightened. He was having a hard time forgiving, much less forgetting. Colorblind is Johnathan’s story of confronting his own racism and overcoming it. It is a story of hope and optimism that all, young and old, should heed. Growing up in Long Beach, California, Johnathan is a fifteen-year-old African American, the youngest of four brothers in his close-knit family. His father is a deputy probation officer, and his mother is a registered nurse. He loves to play competitive soccer, tackle football, and is an ardent fan of rap music, especially Snoop Dogg, Long Beach’s native son. Johnathan hopes that his story about overcoming racism will help others to see multi-culturalism, not color.